Garrett's Ministry Blog: October Ministry Update! 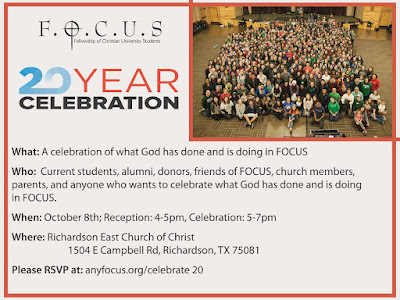 September has come and gone and with it, many big happenings in the Focus ministry at both Collin College campuses. The biggest happening was our 2016 Fall Camp at Camp Copass in Denton. Around 100 of our students from the Collin Focus ministry attended this weekend camp to grow closer to God and one another. It was incredibly fun and encouraging to be with these students and get to worship God with them. When they arrived on Saturday we played slip-n-slide kickball and miraculously there were no major injuries, but it was so. much. fun. It was so great to watch our college students build each other up, cheer for one another, and build community by having fun. We heard sermons from Sarah King (our lead campus pastor at UTA) and Shayla Wright (our very own apprentice!) and they did a great job talking about vulnerability and being brave. On Saturday night we had a worship night where we sang songs of praise, spent a lot of time engaging God in worship in various ways like art, writing letters, kneeling, looking at his creation, etc. 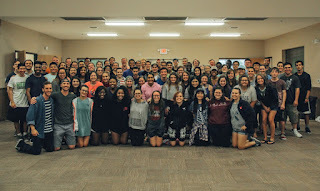 It was amazing to watch students connect with God at a deep and intimate level and then hear their thoughts as we asked them to share at an open mic what God was revealing to them. This camp did a lot to help our community grow closer to God and each other! Another really encouraging thing has been our Thursday Night Focus meetings (we call it TNF). We've regularly been having between 130-160 students that are attending and seeking community. The most recent encouraging thing happened last week as we asked all of our students to bring psalms they had written to share in front of our group. Woah. We had over 60 people share personal and profound psalms of praise to God and it was impacting to everyone in attendance. This has been a part of our students learning how to bring something to worship, not coming empty handed. Oftentimes it's easy to come to worship with an, "I'm here, and that's good enough" mentality. Our students are learning that that attitude does not honor God. They're learning that worship is something that should be happening in our lives on a daily basis, and that TNF is a place where that merely continues in the context of a larger gathering of believers. They've responded to this with soft hearts and eager attitudes and it's made our worship so much deeper and more pleasing to God. 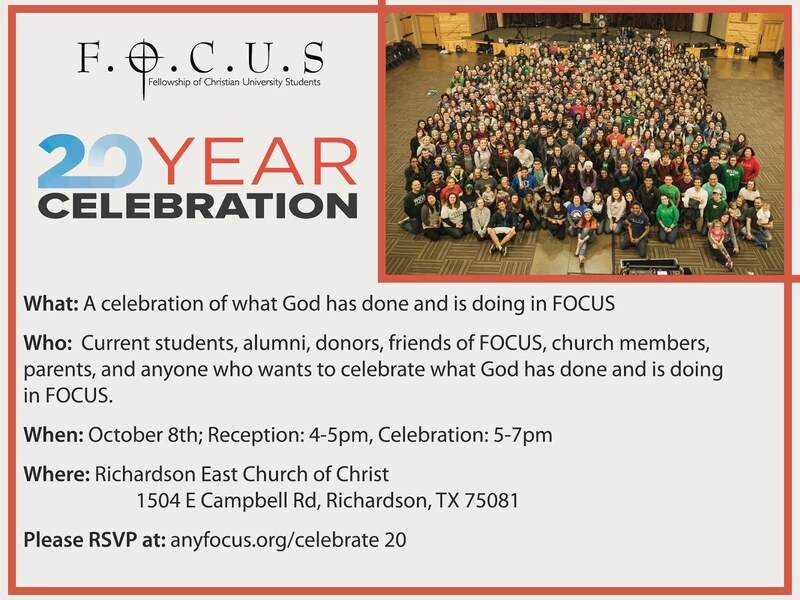 A quick side note: if you have not received the personal invitations I sent you regarding the Focus 20 Year Celebration please see the details below! All of you are invited and it promises to be a great evening! The Spirit is moving, friends! As he continues to move and work in Focus at Collin, I'd ask you to continue to pray for our humble and responsive attention to the Spirit's direction. I've already spoken with many of you personally about how you've been praying and what you've been seeing from your students and I want to thank you so much for that encouragement. God's work on this campus has been the result of his good will and your faithful prayer, and I couldn't possibly be more thankful for you! Until November!